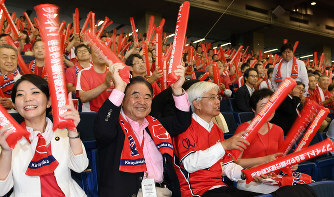 Toshiaki Endo (66), Minister in charge of the 2020 Tokyo Olympic and Paralympics, joined a large cheering squad for Team Kirayaka Bank from Yamagata City, representing his constituency home of Yamagata Prefecture at 87th edition of Intercity Baseball Championship at Tokyo Dome on July 19. Kirayaka Banka, new comer to the Championship, defeated Team Panasonic, 60th veteran and one of the top contenders, 4-3. Minister Endo, former rugby player who has abundant experience in sports-related organizations, played baseball in junior high school. Norio Ichino, President of Baseball Federation of Japan, took the opportunity of Minister Endo’s visit, asked for his continued support to bring baseball and softball back to 2020 Tokyo Olympic. “Baseball is very popular in Japan. I believe that the Intercity Championship will give added impetus to achieve the objective.” said the Minister. The Championship is in progress at Tokyo dome for 15 days starting from July 15, 2016 with 32 teams.